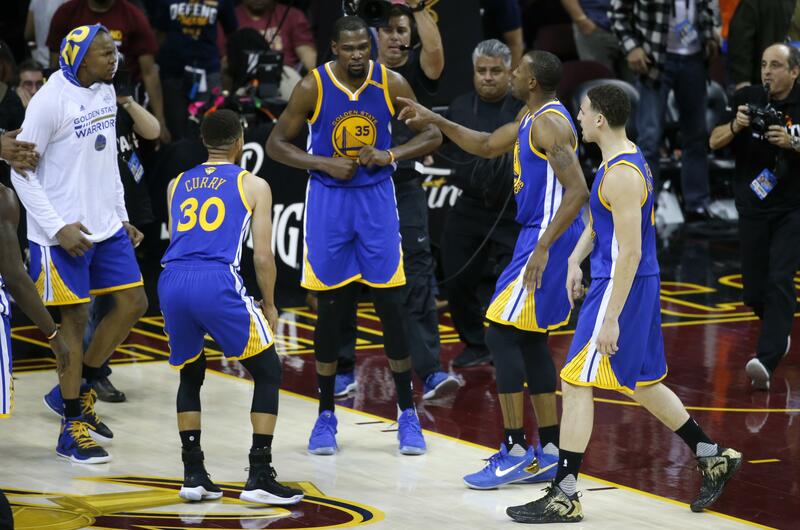 UPDATED: Thu., June 8, 2017, 6:59 p.m.
CLEVELAND – Kevin Durant never demanded he’d get to take the biggest shot of the NBA Finals. The Golden State Warriors made no promises and he knew there were no guarantees. When they met last summer in New York to discuss the biggest decision of his career, neither side even focused on winning titles. They talked about having fun, and now Durant is on the verge of having the time of his basketball life. One win from his first championship and probably the NBA Finals MVP award along with it, Durant is the perfect player in the perfect place. Durant was widely criticized last year when he left Oklahoma City for Golden State, chided for trying to take the easiest route to a title by joining what was already a stacked team. But that wasn’t the way he looked at it. Durant wasn’t thinking about lifting trophies or being fitted for championship rings. He loves to play basketball, and loved the way the Warriors play it. What’s happened is probably beyond what either even imagined. The Warriors had the league’s best record even while losing Durant late in the season to a knee injury, and really turned it on in the playoffs. They are 15-0 and will trying to finish the NBA’s first perfect postseason with a victory over Cleveland on Friday in Game 4. Durant’s 3-pointer over LeBron James with 45 seconds left in Game 3 gave the Warriors the lead for good in a 118-113 victory, providing him a lasting highlight that will be the signature play of this series and perhaps his career. In his postgame interview, he used the word “liberating” to describe the shot, the moment. James has changed teams twice and needed two seasons to win a title both times, so he knows how long it can take for everything to come together. Their situations are different – James never joined a team as strong as these Warriors – but he said he’s proud of Durant’s success and understands why moving to a team like the Warriors was so attractive. Durant is averaging 34 points, 10 rebounds and 6.0 assists in the Finals, joining Michael Jordan and Shaquille O’Neal as the only players with at least 25 points in their first eight Finals games. He fell well short in his first shot at the title, when James’ Miami team beat Oklahoma City in five games in 2012. He never got back to the Finals with the Thunder, and when he was finally ready to consider looking elsewhere, the Warriors offered him exactly what he wanted to hear when they sat down in the Hamptons and talked about where the former scoring champion fit in a lineup with Stephen Curry, Klay Thompson and Draymond Green. A hand that will soon have a championship ring. Even those who hated Durant’s decision can’t question how it has worked out for him when watching how well he and the Warriors have meshed. Published: June 8, 2017, 5:19 p.m. Updated: June 8, 2017, 6:59 p.m.